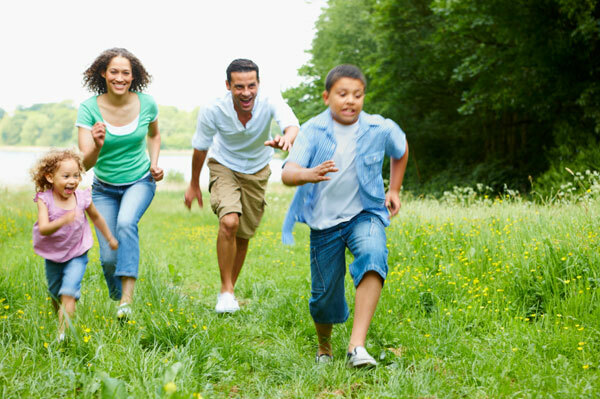 Is your family in an exercise rut? Be an active role model for your kids with these five fun exercises you can do with them. Not only will you physically benefit from these exercises, but they are great for helping you bond and connect with your kids. Exercising with your kids is a great way to get fit, be a good role model and even shed unwanted pounds. Check out our top picks for exercises you can do with your kids. The game of tag may seem like only a childhood game for recess at school, but certified fitness professional Andia Winslow says it is actually considered a High-Intensity Interval Training (HIIT) workout for all parties involved. We know kids love tag, but how do parents fit in? The best part is that you’ll burn around 150 calories playing tag for 30 minutes. Winslow says size is not a limiting factor when doing partner exercises with kids. “Children who regularly assist with or share in workouts with their parents feel empowered and confident. They are part of a team and are developing leadership skills,” she says. Exercise 1 — Pushup clap: Partners, both in pushup start position, align themselves opposite to and head-to-head with one another. On the same count, they perform a pushup, and when returning to the start position, they each clap one hand together with their partner. This move is fun and auditory, and it requires communication and synchronicity, meaning teamwork! Exercise 3 — Jump rope: Do double Dutch or jump together over the same rope. “A lost art! Kids love it, and jump-rope games can go on for hours and can morph into countless variations. Not only does it attend to cardiovascular health, but it is also a high-intensity compound workout. Think muscle building here,” Winslow says. According to the American Council on Exercise, a person burns 0.08 calories per minute per kilogram of body weight when doing a pushup. In other words, someone doing pushups will burn 0.036 calories per minute per pound. So, a parent weighing 140 pounds would burn a little over 5 calories per minute of pushups. How many calories you burn jumping rope also is dependent on your weight and how fast you go, but a typical 140-pound person jumping 70 times in a minute would burn a little over 600 calories in an hour. Mom Annie Pryor says she has lost most of her baby weight by dancing with her kids. She finds that putting on music and dancing around the house is a great way to exercise when you have little time to spend at the gym and during the winter months when it is too cold to go outside. Plus, it’s a great way to burn calories — burning around 220 calories in 30 minutes of fun. But if you do have a Wii…. Fitness expert PJ Stahl, M.A., CSCS, says there are many interactive fitness video games, including yoga, kickboxing, dual fitness challenges and more. “For the next family night, buy some construction paper and create a tournament bracket. Your family will be battling it out in a healthy way to compete for ‘family member of the week.’ Give this winner some weekly perks: Pick dinner one night, pick a TV show to watch etc. The incentive will keep them motivated, and the fitness-oriented challenge will keep your family on track for a healthy lifestyle,” Stahl says.